These sparkling Swarovski crystal skull hair pins add just the right bit of both sweetness and bad-assery to your -'do. 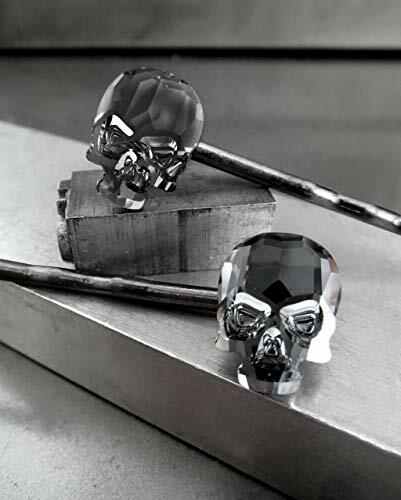 Set of 2 Swarovski crystal skull hair pins in Black Midnight - a moody, deep charcoal-grey color with precision faceting for beautiful depth and sparkle! Please note: each set contains both a right side mounting & a left side mounting pin. Beautifully packaged & presented for easy-gift giving: the jewelry is placed in a sheer plum organza gift bag, tucked into a signature Shy Siren jewelry gift box, and completed with a sheer silver organza ribbon. If you have any questions about this product by Shy Siren Jewelry, contact us by completing and submitting the form below. If you are looking for a specif part number, please include it with your message. Light Pink White Velvet Lace Fabric Flower Large Brooch 6"
Light Peach Yellow White Velvet Lace Fabric Flower Large Brooch 7"